Several dozen Jewish settlers moved into a home near the Cave of the Patriarchs that they say they purchased. Palestinian police brought in the Palestinian owner of the house for questioning, according to Ynet, citing sources in Hebron. The Israel Defense Forces moved into the area after news of the takeover became public and declared the immediate area a closed military zone. The military and police have opened an investigation into the ownership of the home. The IDF called the move “an irresponsible move and a dangerous provocation that may inflame spirits, especially ahead of Land Day” on Friday. Land Day commemorates the deaths of six Arab Israelis killed in 1976 during protests against Israeli government land policies that confiscated privately owned Arab land. Settlers reportedly have been purchasing homes and land in Hebron for many years, though many of the purchases have been legally contested, according to Ynet. 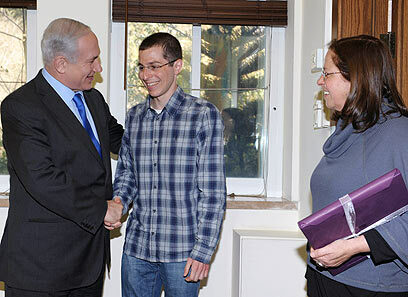 Gilad Shalit who was released five months ago after five and a half years in Hamas captivity met on Thursday with Prime Minister Benjamin Netanyahu in Tel Aviv. Gilad’s parents Noam and Aviva were also present at the meeting. Shalit thanked Netanyahu for his release to which the prime minister responded with: “This year the holiday of liberation (Passover)gets a special meaning. From slavery to freedom; from darkness to light. The prime minister mentioned that throughout the period of Gilad’s captivity, his wife Sara told him again and again to think of the boy living in darkness. 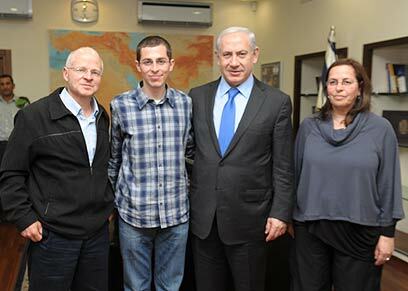 Gilad’s father Noam added that the family sought to meet the prime minister because they wanted to thank those responsible for the release of their son. Aviva Shalit gave the prime minister a book with a dedication: “To the Prime Minister Mr. Benjamin Netanyahu, with respect and esteem…from Gilad and the Shalit family. In February Shalit visited France where he met with French President Nicolas Sarkozy who was among those who worked towards Gilad’s release. Soon Sergeant First Class Shalit will be discharged, though an exact date has yet to be decided. Shaul Mofaz decisively defeated Tzipi Livni to become the new leader of Israel’s Kadima Party. Mofaz received 62 percent of the vote in Tuesday’s Kadima primary to unseat Livni as the leader of Israel’s main opposition party. Forty-five percent of the party’s 95,000 registered members voted in the primary. The Iranian-born Mofaz is a former chief of staff of the Israel Defense Forces. Mofaz and Livni, who both were members of the right-wing Likud Party before joining Kadima, have been fierce rivals for the past several years. In 2008 Livni narrowly beat Mofaz to become Kadima’s leader. Previous party heads were founder Ariel Sharon and Ehud Olmert. Recent polls suggested that Kadima, which has 28 seats in the current Knesset, likely will see its support plunge dramatically in the next elections. That would be the case, the polls noted, regardless of whether Mofaz or Livni was the party’s leader. Israeli troops foiled a terror attack along the Gaza border. The military on Tuesday discovered and defused a powerful bomb planted next to the security fence, the IDF announced Tuesday evening. The bomb was meant to attack soldiers patrolling near the security fence separating Israel from the Gaza Strip, according to the IDF, which said in a statement that the bomb was planted at the end of last week, using the cover of heavy fog. Prime Minister Benjamin Netanyahu on Sunday said that he has no intention of bringing forward the elections. “I’m in no hurry,” he said at the Likud ministers meeting. Knesset elections are scheduled to take place in November 2013. Israeli lawmakers from across the political spectrum launched a caucus to strengthen relations with Diaspora Jewry. At least 40 Knesset members have joined the ad hoc committee co-founded by coalition chairman Zeev Elkin of the Likud Party and Nachman Shai of Kadima, which met for the first time on Tuesday. The lobby will provide an open forum to discuss issues involving the Diaspora, but it cannot set official policy. It was formed at the initiative of Jewish Agency chairman Natan Sharansky, according to reports. A new study of Israelis conducted by the Jewish Agency found that 91 percent of respondents believe that Israel should help Jewish communities abroad. Another 91 percent said they believed that Diaspora Jewry would stand with Israel in the face of a threat from Iran or other enemies. Jewish Agency Secretary-General Josh Schwartz presented the study at the committee meeting. Israeli authorities are investigating a French media report that Toulouse terrorist Mohammed Merah visited Israel. Merah’s passport, found by French police after he was killed in a shootout Thursday, showed that he visited Israel, Syria, Iraq and Jordan, the Le Monde newspaper reported. Merah had confessed during the more than 30-hour standoff at his apartment in Toulouse to a gun attack on the city’s Ozar Hatorah school on March 19 that killed Rabbi Jonathan Sandler, 30, and his two young sons, as well as the 7-year-old daughter of the school’s principal. A self-described al-Qaida member, Merah also was wanted for the murders of three French troops. Israel’s Interior Ministry said it had no record of a Merah’s name among tourists who entered the country in recent years, but police and secret service authorities said Sunday the possibility that he had visited under another identity was still being checked. The United States plans to release $88.6 million in development funds for the Palestinian Authority. Congress members announced the planned release Friday to the grudging gratification of the PA, which needs the money to stay fiscally afloat. In August, Republican lawmakers froze $147 million in U.S. aid to protest the PA’s attempt to sidestep stalled peace talks with Israel and win statehood status at international forums. Rep. Ileana Ros-Lehtinen (R-Fla.), chairwoman of the House of Representatives Foreign Affairs Committee, limited the release to $88.6 million. “Last weekend there were three murders in the Arab sector. Reducing crime in the Arab sector is a goal of the Government and it needs to be a goal of the country. I appreciate the fact that there are increasing voices from within the Arab sector, from its leaders, mayors and citizens, calling for stepped-up law enforcement within Arab communities and villages. I think that this is an important change. I add to this my call for enlistment in the civilian service, within which it will also be possible to combine actions for increased law enforcement. The community can help itself. The Arab sector can help itself vis-à-vis increased law enforcement by volunteering in the civilian service as well. Last week I attended a conference that the Government organized on increasing the involvement of Israeli Arabs in Israel’s economic growth. We spoke there about the steps to involve them in the economy, education, transportation, access to jobs and many other issues. I think that all of these things are important. While the Government has invested billions of shekels in moving forward on these goals in the Arab sector, I would like to say that without law enforcement, none of these steps will achieve the goal that we are hoping for and striving toward – i.e. the integration of Israeli Arabs in the State of Israel’s progress. בסוף השבוע שעבר בוצעו בתוך יממה שלושה מקרי רצח במגזר הערבי. צמצום הפשיעה במגזר הערבי זה יעד של הממשלה והוא צריך להיות יעד של המדינה. אני מעריך את העובדה שעולים קולות מתוך המגזר עצמו, מתוך מנהיגיו, ראשי הערים ואזרחים שקוראים להגברת האכיפה של החוק בתוך היישובים והכפרים הערביים. אני חושב שזה שינוי חשוב. אני מוסיף לזה את הקריאה שלי להתגייסות לשירות האזרחי, שבתוכו ניתן גם לשלב פעולות להגברת אכיפת החוק. הקהילה יכולה לעזור לעצמה. המגזר הערבי יכול לעזור לעצמו באכיפה חזקה יותר של החוק, גם באמצעות פעולות התנדבות בשירות האזרחי. בשבוע שעבר השתתפתי בוועידה שהממשלה ארגנה, להגברת השותפות של ערביי ישראל בצמיחה של כלכלת ישראל. דיברנו שם על צעדים לשיתופם בפיתוח כלכלי, בחינוך, בתחבורה, נגישות למקומות תעסוקה ונושאים רבים אחרים. אני חושב שכל הדברים האלה הם חשובים. הממשלה השקיעה מיליארדי שקלים כדי לקדם את היעדים האלה במגזר הערבי, אבל אני רוצה לומר, שללא אכיפת חוק, כל הצעדים הללו לא ישיגו את היעד שאנחנו מייחלים לו ופועלים למענו – כלומר, שילוב של ערביי ישראל בקדמה של מדינת ישראל. לצד כל המעשים הללו שאנחנו עושים ולצד כל השותפות הזאת, חייבת להיות שותפות גם באכיפת החוק. אנחנו נפעל מהצד שלנו. אני מצפה להיענות מעשית מנציגי הציבור של המגזר הערבי להגברת אכיפת החוק ביישוביהם. Israeli Foreign Minister Avigdor Liberman reportedly said he might recall Israel’s ambassador to the U.N. Human Rights Council after the council voted 36-1 to investigate the effects of Jewish settlements on Palestinians. Liberman also said Israel would not cooperate with the fact-finding mission established by the council to probe settlements, the Jerusalem Post reported. On Thursday, the council passed a resolution, with 10 abstentions, to investigate how Israeli settlement construction affects Palestinian human rights. The United States was the only country to vote against the resolution. The Israeli leader noted that the council has made 91 decisions, 39 of which dealt with Israel, three with Syria and one with Iran. “One only had to hear the Syrian representative speak today about human rights in order to understand how detached from reality the council is,” he said. The decision requires the council to “dispatch an independent international fact-finding mission, to be appointed by the President of the Human Rights Council, to investigate the implications of the Israeli settlements on the civil, political, economic, social and cultural rights of the Palestinian people throughout the Occupied Palestinian Territory, including East Jerusalem.” The mission will generate a report for the council. The council on Thursday approved five resolutions critical of Israel, including implementing the Goldstone report on the Gaza war and criticizing Israel’s occupation of the Golan Heights. The resolution on the settlements, which calls on Israel to cooperate in the investigation, also called on Israel to prevent settler violence against Palestinians in the West Bank. Thousands gathered in Jerusalem for the funeral of the four victims of the attack on a Jewish school in Toulouse, France. Rabbi Jonathan Sandler, 30, his two young sons Gabriel and Arieh, and Myriam Monsonego, the 7-year-old daughter of the Ozar Hatorah school’s headmaster, were buried Wednesday morning as police in Toulouse remained in a standoff with the chief suspect in the attack. The school reopened Wednesday for the first time since Monday’s attack, in which a man riding a motorbike opened fire outside the school where students were waiting to enter the building at the start of the school day. “Your grief, your pain is ours, too,” French Foreign Minister Alain Juppe said at the funeral. “All of France is in shock.” Juppe said that France would work to fight against anti-Semitism. Knesset Speaker Reuven Rivlin also spoke at the funeral. Prior to the funeral, the parents of Myriam Monsonego and the pregnant wife and mother of the Sandlers arrived at a Jerusalem funeral home to say their final goodbyes to their loved ones, whose bodies arrived in Israel following a memorial service at Charles de Gaulle Airport in Paris, with President Nicolas Sarkozy and Prime Minister Francois Fillon in attendance, Haaretz reported. A member of Hamas was charged in a thwarted terrorist attack and kidnapping of an Israeli soldier near Eilat. The Shin Bet security agency arrested Muhammad abu-Adarah, 20, last month, it was learned Wednesday after a gag order was lifted on the case, when he tried to infiltrate Israel from Gaza. Abu-Adarah was indicted Monday in Beersheba District Court on charges stemming from plans to initiate an attack on Israel through Sinai. He reportedly was to fire rockets on the Eilat area while other operatives were to kidnap an Israeli soldier and sneak a terrorist cell into the area. Iranians have responded to a Facebook page posted by an Israeli couple that communicates the message that Israel loves Iran. “Today we had a savage crime in France that gunned down French Jews, among them children. It’s too early to say what the precise background for this act of murder is, but I think that we can’t rule out that there was a strong murderous anti-Semitic motive here. I’m sure that Nicholas Sarkozy, the President of France, and his government will do their utmost to find the killer and we, in Israel will do everything to help them in this task. The shooting attack that killed four people — a teacher and three students — at a Jewish school in Toulouse, France, is linked to recent deadly attacks on French soldiers, forensic tests indicate. A man riding a motorbike reportedly opened fire Monday morning outside the Ozar Hatorah School, where students were waiting to enter the building at the start of the school day. The shooter then entered the building and continued shooting at students and teachers before fleeing on his motorbike. Several students also were injured inside the building. The dead are reported to be a 30-year-old rabbi and his 3-year-old and 6-year-old sons, as well as the 10-year-old daughter of the school’s principal. Some 200 students attend the school, according to Israel Radio. Thank you very much. Thank you all, thank you. Todah rabah. My son’s name is Avner. He is Israel’s National Bible Champion and he came number two, second deputy, in the International Bible Contest. It’s a quiz; it’s like the spelling bee to the nth degree. It’s very hard and he, at the age of 15, did this. I have to tell you that he didn’t make World Champion because of the Prime Minister’s question. I asked it. But it tells you what kind of society we are. And I’ll tell you more about that in a minute. I do want to say that I do read the bible. I read it yesterday. We read it every Saturday actually. Every Shabbat, after lunch we sit down and read parashat hashavu’a, the Portion of the Week. We read Exodus now. Then you have the haftara. It’s the addition from the Bible. This was from Ezekiel. Am I correct? Absolutely. So I draw, like you, enormous reservoirs of strength from the Torah, from the Bible. This is the well from which we drink; this is the stone on which we stand. And I know this is only the beginning because there’s a dramatic transformation that’s taking place in the relationship between Christians and Jews. For centuries this relationship was focused on our differences and our tortured past. But today, thanks to leaders like you, Jews and Christians are focusing on the common future that we have and the common values that we share. Now you look around the shifting sands of this turbulent, windswept Middle East and it’s clear that these shared values that we have, set Israel apart, just as it’s clear that these shared values bring Israel and America together. What are these values? They’re values that spring form our common heritage, from the revolutionary ideas that were first formulated in this land millennia ago. One of these ideas that we read about is from the Book of Samuel, the Second Book of Samuel, and I want to tell you about it. In a very oblique way it touches on the thing that I told you about, the prime Minister’s question, but it’s deeper. There was a king in this city, King David. He was a great king, but he was not without sin. One day he was looking out from his terrace in the Old City of Jerusalem, David’s City, and he sees Bathsheba. He asks to bring her to him. After she’s with child from him he says “Bring her husband.” Her husband is Uriah the Hittite, a very brave commander in the army of the Israelites fighting in Transjordan and David says “Bring him home. Give him a leave of absence.” But Uriah, who was brought to Jerusalem, refuses to go home to Bathsheba. He says, “When my men are in battle, I will sit, I will sleep on the doorstep of my king.” So David gives an order to Joab, the military commander, to put Uriah on the front lines back in Transjordan, in Moab I think, or Amon, Amman which is today the capital of Jordan. And this is done. And Uriah dies in battle. David marries Bathsheba. End of story, right? That’s a revolutionary statement in human affairs. That’s an impossible statement 3,000 years ago, when the world was ruled by all-powerful empires with all-powerful kings and emperors. Who could possibly say that in antiquity and live? Well, Nathan said it to the King and lived. This was inscribed in our bible. This is such a revolutionary thing. Power is not all-encompassing. All men are equal under God. All men and all women – equal under God with inalienable rights. This is a Jewish concept; it’s a revolutionary Jewish concept. I think that this message took time to resonate throughout the ages that power is not absolute and that no-one is above the law. And those values, like many others, are rooted in the Bible. They were passed from one generation to another of Jews; they were spread far and wide by Christians; and they eventually helped spark a new era of freedom and progress. I recently went to Holland, where I learned about one of those sparks. I visited this wonderful old synagogue of the Portuguese Jews in Amsterdam. It was absolutely remarkable, very beautiful. And there is a library there of old Jewish writings throughout the ages. One of them is of Maimonides, a great Medieval Jewish scholar. Maimonides was read by an Englishman – Isaac Newton. Newton not only read Maimonides, he read the Bible, in Hebrew. And he decided to recommend this book to a friend of his. His friend was John Locke, the famous philosopher of religious tolerance, the famous writer of religious tolerance. Locke was influenced by these same ideas that shaped our civilization and then proceeded to shape the United States of America. The American Revolution and other movements of progress are all coming from that same wellspring, with additions, with important changes, with important elaborations, but this is the source. This is the water. The waters of the Shilo’ah. We are all drinking from that same well; we are all heirs to a great civilization. A civilization that is the source, the wellspring of the values which we so deeply cherish. And those values ensure that Israel’s minorities, including over one million citizens who are Arabs, always have full civil rights; values that ensure that Israel’s Government will never tolerate discrimination against women, and values that ensure that Israel’s Christian population will always be free to practice their faith. That’s the only place in the Middle East where Christians are fully free to practice their faith. They don’t have to fear; they don’t have to flee. In a time where Christians are under siege in so many places, in so many lands in the Middle East, I’m proud that in Israel Christians are free to practice their faith and that there’s a thriving Christian community in Israel. And these shared values set Israel apart from regimes like Syria, that butcher their own people mercilessly, and from terror organizations like Hamas, Islamic Jihad and Hezbollah that indiscriminately fire rockets on civilians and hide behind civilians – it’s a double war crime, and from countries like Iran whose leaders foment terrorism and violence around the globe and call for our destruction. I don’t need to explain to you why this regime must never be allowed to have nuclear weapons. I don’t need to explain this to you because you get it. You all get it. You get the main point – that our enemies don’t hate us for what we do; they hate us for what we are. When I say us, I mean Israel and the United States – two allies anchored in common values, in seeking a common future of freedom. This is why they hate us. It’s not a simple battle and it’s one that the Jewish people have endured for many centuries. Do you want the good news or the bad news? What do you want first? Bad news. You’re like me… The bad news for the Jewish people can be summed up in two words: numbers count. Big populations have large economies, they have the resources to field large armies; military power produces political and economic power which in turn produces more military power. Numbers count. That’s bad news for the Jewish people because our numbers aren’t that big. And we were more-than-decimated in the previous century. We’re a tiny nation in numbers. We’re six million in Israel and barely 13 million worldwide. So that’s the bad news. Do you want the good news? I’m sure you want the good news. The Jewish people have always defied the laws of history. Our improbable odyssey through time, a nearly 4,000 year journey marked by indescribable tragedy and sublime triumph – our odyssey has broken every rule in the book. Writing in 1968, Durant hints that the young State of Israel, we were only 20 years old, he hints that this young state powered by deep wellsprings of faith and culture may continue to defy the laws of history. And we have: we’ve defended ourselves time after time against much larger enemies; our innovations have made Israel a technological powerhouse; our Nobel Prize winners have propelled humanity forward (by the way Israel has more Nobel Prize winners per capita than any other country in the world), and the towering genius and spirit of our people finds expression in every field: in science and medicine, in technology and industry, in art and culture. And here’s more good news: the Jewish people are not alone. We’re not alone because we have the support of each and every one of you. And we’re not alone because we’re uniquely blessed by the support of tens of millions and even more across the United States and countless other countries across the world. Yes, numbers count, but so do you. So I want to thank you, Christians United for Israel. I want to thank you for standing up for Israel; I want to thank you for standing up and being counted. May God bless you all. Thank you.